Here is the third in the four-part Alaska vacation series. Thought it was three, didn’t you? Last week was the mechanics, or workings of logging camp. Now, the people. Holy cow, this is 38 years ago. Forgive me if you were there and find my facts don’t ring true. It rains most of the time in Southeast Alaska and we learned to work in it (now it feels like I never left). Our tin hats had brims all the way around so the rain didn’t go down our necks. Our jeans had the hems cut off and were “high water” so they didn’t get snagged when we ran to safety as the logs were pulled away. We all wore suspenders on our baggy pants for freedom of movement. These sorts of things evolved over the years. OSHA, you are not needed. There were seven “sides” at the camp and we had a friendly competition in production. Our side was made up of misfits (as if there was something else in Southeast Alaska), a la the old Oakland Raiders. The hook tender was a guy named Warren. He was a drunk but managed to show up for work. He flew to town every weekend. I don’t imagine he saved up a dime. He called me “the snail.” I wasn’t really all that slow but I helped new guys be more efficient to learn the finer points, and that took some time. The hook tender sets up the routes for the lines (cables). Warren did that alright, then he’d sit on a stump at the back of the show and smoke cigarettes, yelling at us to hustle. I punched him in the nose and everybody cheered when he fell over backwards off that five-foot stump. I guess Warren didn’t fit in with the misfits. He was fired the next day. His replacement was Chuck Saxton, who became a good friend. Chuck was from a logging family in Roseburg, Oregon. He knew my roommate, Ron, from down there. Ron had some pretty good cassette tapes. He would go out in the narrow hallway in the middle of the night and spew a mouthful of Everclear, lighting it with his Zippo. It made a huge flame and the smoke alarm would go off, causing some irritation to the neighbors. As soon as Chuck had the sheaves (don’t call them pulleys!) tied to the stumps for the haulback, he would pitch in until we got to the end of that road. We became a well-oiled machine, each with his specialty; tight logs, tall logs, logs that required complicated sets to get around obstacles. We ran, we jumped. It was like football with purpose. My knees hurt. They called us the screwball crew, as a negative version of the usual highball, which meant fast and productive. Eventually the screwball crew outproduced every crew in camp. We whistled “Whistle While You Work” as we left the mess hall every morning. There is not enough room for what needs to be said here so the story will continue next week. But since this is the week of Independence Day, there are some points that need to be mentioned because the voices who speak the truth are, so often, marginalized as fringe or nutty. The Revolutionary War was fought for the colonies to secede from their own overarching government that redistributed wealth from the productive citizens to the aristocracy. This war was not unique. The so-called Civil War (six to eight hundred thousand dead is hardly civil) began as the agrarian South was seeing the Yanks doing the same that King George did to the original colonies. The same is happening in Ukraine today. Hong Kong has a burgeoning “democracy” movement as they find the wealth created by an economy once much freer than ours, is increasingly tapped by the Beijing government to supplement their wasteful central planners. Remember this Fourth of July that our Revolutionary War was fought against our own government, not a foreign power. Presenting King George’s England as a foreign power has a purpose: To make us think only foreigners can be our enemies so we will be obedient to our government and accept such plunder as The Affordable Care Act and Environmental Protection Agency, like it is the patriotic thing to do. Remember the extreme sacrifice the colonists made for us by upholding the principles for which they fought instead of bowing down to the state that pretends to uphold those principles as it focuses on symbols and slogans. An interesting article in today’s War Street Journal stated that 71% of 17 to 24 year olds were not qualified to serve in the military. Reasons given were obesity, prescription drug use of the kind that makes teachers’ jobs easier because the children are numb, tattoos, lack of education and many others. I’ve posted a related story below. Ms. Beck, author of “Warrior Princess,” spoke to the DIA on June 18 as part of the intelligence agency’s annual Pride Month — formerly Gay Pride Month but now expanded to include a host of sexually related terms, including transgenders. She received an award from DIA Director Army Lt. Gen. Michael Flynn at the event . Ms. Beck said she is not “pushing” for transgender integration in the military. “I am speaking about being a ‘human’ and the value of people in the armed forces,” she stated in an email . and to fund the socialistic programs, Social Security and Medicare. How much of Reagan’s foreign policy would Rand Paul have supported? The Kentucky Republican doubts that Reagan would have committed U.S. troops to driving out Saddam Hussein, as President George W. Bush did. And he strongly implies that Ronald Reagan, like the senator, would not want to involve the U.S. in Iraq’s current catastrophe. To support the similarity between his views and Reagan’s, Sen. Paul cites the Weinberger Doctrine as a summary of the 40th president’s views on foreign interventions. Caspar Weinberger, Reagan’s secretary of defense, articulated what came to be known as the Weinberger Doctrine in a November 1984 speech at the National Press Club. As accurately summarized by Sen. Paul, Weinberger said the U.S. shouldn’t commit combat forces unless America’s vital interests are involved, should do so only if we intend to win, have clear political and military goals, the capacity to achieve them, the support of Congress and the U.S. public, and act only as a last resort. Sen. Paul wants his readers to believe that Weinberger’s view was Reagan’s view. As he prepares for his all-but-certain presidential run in 2016, Sen. Paul seems to have decided that he needs to refine his—and his father’s—reputation for non-interventionist absolutism. A Washington Post-ABC poll this week suggests that U.S. attitudes toward intervention are in flux, and a center may be re-forming over how much global disintegration the public is willing to accept. Though most oppose ground troops, about 54% of men want the U.S. to bomb ISIS, the al Qaeda affiliate overrunning much of Iraq. More striking, 44% of Democrats want to hit them. Women are opposed by a slim 52%. Let us posit that Ronald Reagan did not wake up each day from 1981 through 1988 and read opinion polls before figuring out what to do about the world’s realities. As to the Gipper’s principles, Sen. Paul overstates reality when he suggests that the Weinberger Doctrine was Reagan’s doctrine. The Weinberger Doctrine described in Mr. Paul’s piece was Caspar Weinberger’s personal opinion. His speech occurred amid an internal Reagan administration debate about how to deal with a new and murderous global threat: terrorism flowing out of the Middle East. Wonder Land Columnist Dan Henninger on the implications of the emerging bipartisan consensus on an isolationist foreign policy. Photo credit: Getty Images. 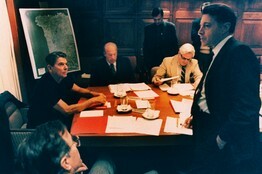 Ronald Reagan called the Soviet Union an “evil empire,” aligned his own policy toward Soviet Communism with the idea of “rollback,” stood at the Brandenburg Gate and cried, ” Mr. Gorbachev, tear down this wall,” increased U.S. defense spending, deployed Pershing 2 ballistic missiles and cruise missiles in Europe amid world-wide protests in 1983, invaded Grenada the same year, and gave U.S. support to anticommunist movements in Afghanistan, Cambodia, Angola and Latin America—with many congressional Democrats in a towering rage of eight-year opposition to nearly all of it. The words Reagan used most to support all this were “freedom” and “democracy.” He ended four decades of Cold War. That is the Reagan mantle. Which parts of it would Rand Paul have taken on? The experiences of the U.S. during the past five years with Barack Obama has led to one clear, nonpartisan conclusion: The risks of a rookie presidency are too big. Barack Obama created a wondrous presidential campaign machine. His experience to govern a nation was zero. More than any time in memory, whoever is president in January 2017 will have to hit the ground running with a plan—from day one. Conservatives or candidates who think it should be possible to ride charisma or even ideology to victory, and then figure out the details of a great nation’s policies once in power should read Martin Anderson’s detailed 1988 account of Ronald Reagan’s path to the White House, “Revolution.” And specifically, the chapter “Reagan’s Advisers.” It is a blueprint for at least the chance of a successful presidency, which the U.S. desperately needs. Reagan’s was a remarkable presidency. But Ronald Reagan was no rookie. And there is no such thing as a presidential prodigy. We know that now. Bosses at the EPA are urging a snitch to come forward and reveal who is pooping in the hallway. Maybe this employee is a crack investigator who takes to heart the old saying, “it takes one to know one.” Hard to tell. But Huffpo finds there are a lot of naughties going on at Nixon’s great accomplishment. Read more here: http://www.huffingtonpost.com/2014/06/25/epa-pooping-hallways_n_5530650.html. No matter how disgusting the employees are, however, it is the agency and its rules and regulations that drain our economy that should get the most attention, not some idiot pooping in the hallway. Although this idiot is probably the best choice for a mascot for the agency. “Two top U.S. business lobbies plan to publicly break with President Barack Obama over imposing more sanctions on Russia because of the crisis in Ukraine after the White House rebuffed their objections. Eastern Ukrainians don’t want to be allied with the US puppet Ukrainian government in much the same way The South preferred not to be a colony of the Yanks or the 13 colonies wanted out from under the thumb of George III. As always, sanctions only work on the network news. The truth comes out later that people suffer while government shifts the blame and comes out smelling like a rose. I can hardly wait to see federal agents stop a shipment of John Deeres and lay-offs help recruit radical free traders. Just like our drones help recruit terrorists.